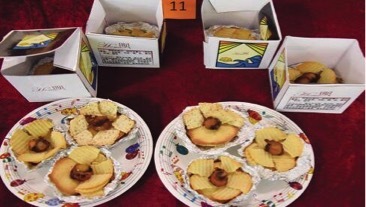 After my recent post on innovative products based on Chinese vinegar designed by young food technologists, I am posting a similar blog about a contest for new fish-based foods. The contest has been organised by the National Engineering Research Centre of Seafood (Dalian, Liaoning). The assignment was again to create snacks, or in Chinese terms: leisure food. Fish meat wrapped in a mixture of mashed potatoes and minced shrimps and a little cheese. The name needs a some explanation. It is a pun on the Chinese expression xinyousuoshu, literally: ‘all hearts belong to someone’, meaning all people have someone they love. 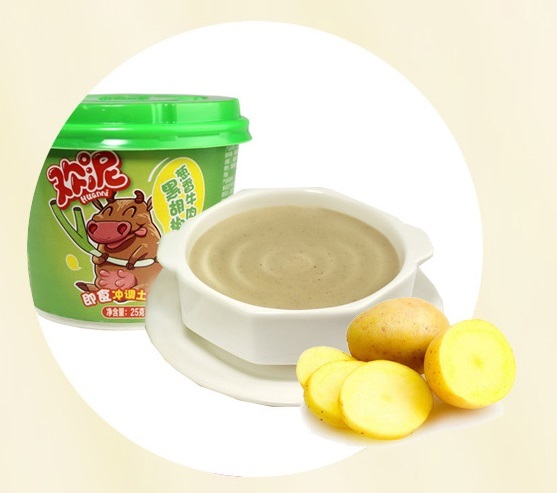 In the product name, xin ‘heart’ has been replaced by ‘xian’ fresh, umami, and shu ‘belonging’ to shu ‘potato’ (same sound, different character). So, the literal name translates in English like ‘umami belongs to potatoes’. If this product will ever make it to the shelves of overseas supermarkets, the producer will probably have to think of more palatable brand name. This is more or less literally what the name says: layers of dough with pieces of squid in-between. There we go again, a pun as a product name that poses a challenge for the translator. The name literally means something like: ‘you squid biscuit’. However, pronounced with different tones, you get an expressing meaning: ‘you are talking nonsense’. Great. The product is indeed a biscuit with squid flavour. According to the description it is both sweet and savoury. The name promises ‘baked trout’. According to the inventor, this product is based on an existing Japanese snack using sea bream. It also contains matsutake mushrooms and a again a little cheese to add a milky flavour. 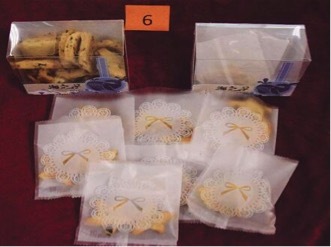 These are cookies with a fishy layer, but the description fails to mention the raw materials. Home is written in Latin letters. The character bei refers to (shan)bei ‘scallops’. These are scallop flavoured potato crackers. The literal meaning of this name is ‘flavour of fish paste’, however zhi ‘of’ has been replaced with a homophone meaning ‘cheese’. 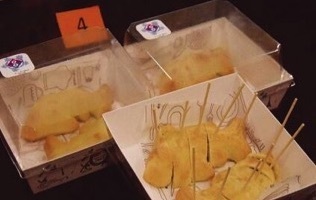 The snacks are produced by steaming fish paste coated with cheese. This ‘seafood round dance’ uses rounds of squid, egg, scallops and crab meat as raw materials. According to the inventor, it this product should have a huge potential market. Who will give him an opportunity to test it out? 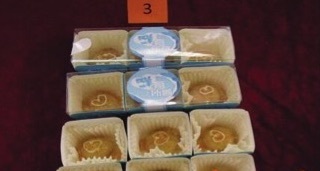 In Chinese, laba ‘trumpet’ can also be used for objects with a wide mouth, hence the funny name for tartlets like these. 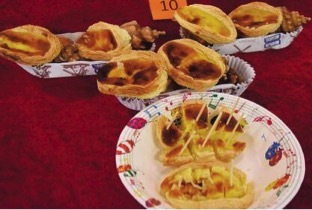 The inspiration has come from a sweet Cantonese dim sum called ‘egg tart’, but uses whelk protein in the filling. It is positioned as a health snack by its inventor. 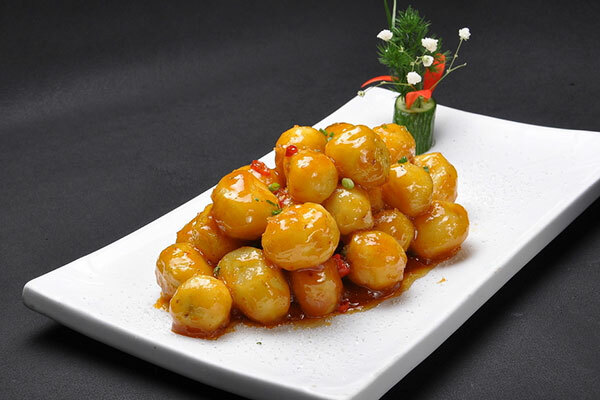 As with the vinegar-based products, the novel foods presented in this post give a valuable insight in the minds of young Chinese food technologists currently graduating and looking for jobs in the industry. I like these contests, so will post all of them, as they appear in the Chinese media. 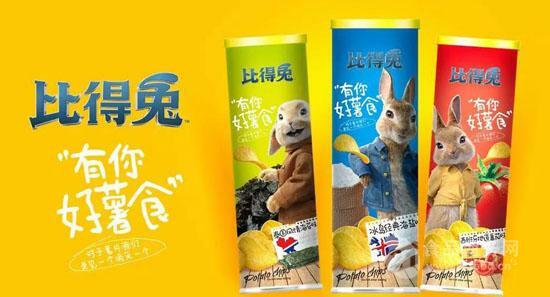 Innovative product launches in China is one of my favourite themes in this blog. You can find lots of them in various posts. While we all know that China currently is the world’s largest growing market for food ingredients, both for exporting and sourcing, what is still less known is that no region on the globe sees so many new foods and drinks being launched as China. And innovation in end products is a major creator of demand for new ingredients. In this last post of 2015, I have delved in the news items on new products that I have retained during my daily scanning of the news streams from China. Apparently, I believed these products were somehow worth saving. Well, I am presenting the to you, my readers, today. Please don’t feel obliged to like them as I did when I saved them. However, please also do not judge them too quickly as funny or useless. Instead, try to see them as reflections of how Chinese food technologists think about developing new foods, drinks, or ingredients. An interesting finding, after arranging the novel products according to market segment, is that dairy company Mengniu stands out as China’s top food innovator of 2015. As for time of launching, there seems to be no real favourite month or season for putting new products on the market. However, there are now launches found for the final quarter of 2015. Perhaps the winter blues are affecting food technologists in China. Moving on to region, Beijing and Inner Mongolia come out on top with 3 launches each. However, all new products of the latter have been launched by one company: Mengniu. A distinctive feature of the new foods and drinks from Beijing is that most of them have been developed in cooperation with a research institute or university. Using the traditional Chinese division between North (of the Yangtze River) and South, nearly all (13 out of 15) of the novel products have been launched in the North. 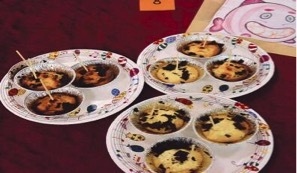 Considering that the home town of Mengniu, Huhhot, is located close to Beijing, as is Tianjin, then almost half (7) of the products have been developed within a large circle around Beijing. I wish you all the best for 2016 and can assure you that new posts will appear here as frequently as in the year behind us. Bairun Flavour & Fragrance (Shanghai) has announced that it will increase its investment in its subsidiary Tianjin Cocktail (Tianjin) from RMB 280 to 500 mln for the production of the Rio range of cocktails. The reason for this decision is the sharply increased demands for ready to drink cocktails. Shanghai Bacchus, one of the leading companies in the Chinese alcopop market, has increased its purchase of Bairun cocktails to 6 438,400 cases in 2014, 8 times the volume of 2013. Note that another innovative aspect of this item is that it is initiated by a producers of flavours, rather than one of alcoholic beverages (July). In 2017, Bairun’s turnover was RMB 1.17 bln, 87.81% of which was derived from the sales of Rio. It is about time to highlight another region in this blog. After Pu’er in China’s southernmost province Yunnan, I am taking you to the opposite in this blog, to Harbin, the capital of Heilongjiang, which shares a large border with Russia’s Siberia. What Harbin has in common with Pu’er is that it is not a purely ethnic Chinese city. The name Harbin already betrays that it is not Chinese. A number of stories about the name’s original meaning; one is that it means ‘place to hang fishing nets to dry’ in Manchu, the language of the people with the same name. The Manchus were once a powerful nation, and the emperors of the last imperial dynasty of China, the Qing Dynasty (1622-1912) were Manchus, not Chinese. After the Russian Revolution, a large number of Russians fled to Manchuria, with Harbin as their unofficial capital. It gave Harbin its nickname ‘Moscow of the East’. A number of Russian buildings still survive, like the orthodox cathedral. Moreover, some Russian words entered the local dialect. The most famous one is lieba, from the Russian chljeb ‘bread’. 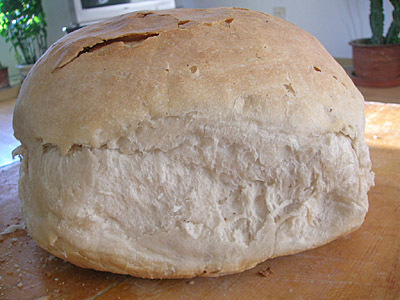 It refers to a large round bread baked with beer yeast. This type of bread has become the symbol of Harbin cuisine. 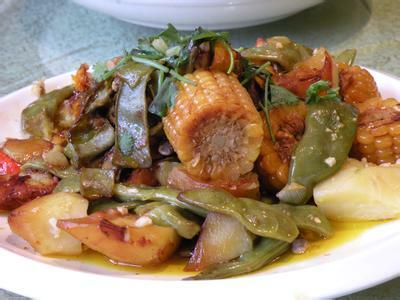 Watch this video for more information about the Russian influence on Harbin cuisine. When the Japanese invaded Manchuria, they more or less let the Russians live there in peace, while the Russians accepted Japanese rule; they had no choice. 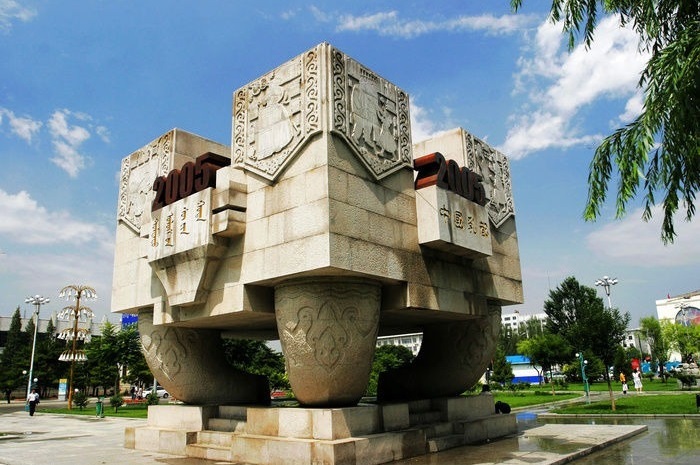 In fact, for a short period, Russians, Chinese, Japanese, Koreans and several national minorities (in particular Manchus and Mongolians) lived in a peaceful coexistence in Harbin. This ethnic diversity has created an equally diverse local cuisine. Besides the afore mentioned bread, dairy products also became part of the diet of Harbin people, long before Chinese elsewhere started to appreciate the white gold. 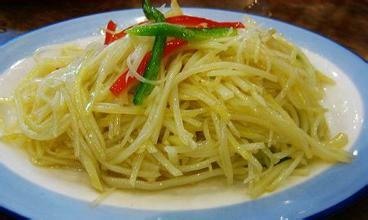 The potato, the typical staple of Western cuisine, has also grown roots in this city. The consumption of coffee is also increasing rapidly in Harbin. Insiders report that there were more than 400 coffee shops in the city at the end of 2015, consuming about 60 mt of coffee beans per year. Heilongjiang is one of the prime agricultural regions of China. The chernozem soil in Harbin, called “black earth” (Heilongjiang literally means: ‘Black Dragon River’) is one of the most nutrient rich in all of China, making it valuable for cultivating food crops. According to the municipal statistics of 2013, Harbin alone was good for more than 2% of the national grain output, 1% of the meat and 4% of dairy products. Heilongjiang is one of the major grain-producing areas in China, ensuring food security for the country. The grain output of the province reached 67.6 billion kgs in 2014, leading the country’s provinces since 2011 and accounting for one-tenth of the national total. 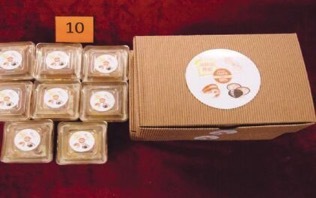 In recent years, the province has pushed forward agricultural modernization, promoted the green food industry and established marketing platforms for Internet Plus agriculture. A sophisticated Internet Plus marketing platform has been established for rice products in the province. Heilongjiang rice is of high quality but used to sell poorly. The following table shows the development of the total turnover of the Harbin food industry during the past few years. The processing of agricultural produce was still the most prominent activity in the Harbin food industry in 2013, as is shown in the following breakdown. Wondersun Dairy Industry Co., Ltd.
Wondersun is part of Heilongjiang’s biggest Agricultural State Owned Enterprise called Beidahuang Group. The company is ranked as fifth among China’s dairy enterprises and holds 7 subsidiary companies and 41 factories. Wondersun’s liquid milk ranks among the top ten in the country and was assessed as one of China’s most valuable brands in 2003. The company has formed a strong sales network that covers the whole country. Wang Jinghai, president of Wondersun, believes Heilongjiang is ideal for raising cows and producing dairy. The company is expected to sell products worth RMB 50 mln in 2015 through e-commerce channels and has set a sales goal of RMB 300 mln next year. Heilongjiang Dairy Group Co., Ltd.
Heilongjiang Dairy Group was established in 2004, and the companies registered capital is 213 million RMB. It is one of the key national enterprises in the agricultural industry in China. The main shareholder is the Haerbin HIT group with 10 other small shareholders. The company has four brands, and the brand Longdan and Jinxing have a high reputation in the entire country. 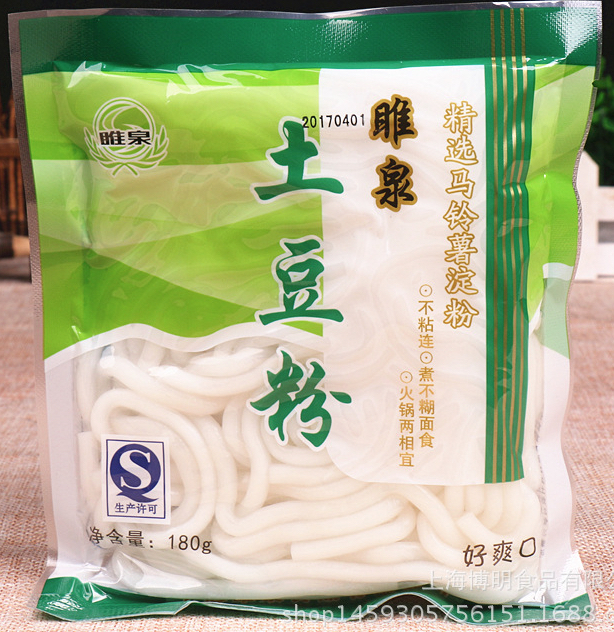 Beidahuang has 16 agriculture branch companies and Haolianghe Fertilizer Company. It is also the parent of Beidahuang Grains Co., Ltd., and Harbin Longken Malt Co., Ltd.. 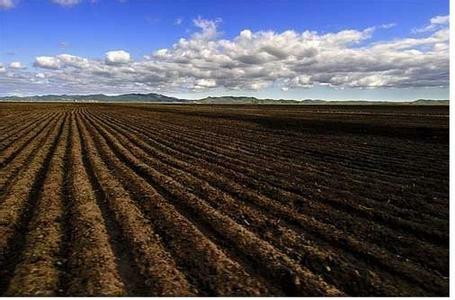 The company owns 624,000 hectares of land. The main crops are rice, soybeans, corns, wheat and brewing barley, supplemented with crops cash crops like red beans, kidney beans, pumpkin seeds, lucerne, medicinal herbs and flax. Haolianghe Fertilizer Co., Ltd. has an annual production of 200,000 mt of carbamide and other fertilizer products. Beidahuang Grains Co., Ltd. has an annual production of 1.4 million tons of refined rice and 100,000 mt of other byproducts. The yearly malt output of Harbin Longken Malt Co., Ltd. is 200,000 mt. Harbin has been on the radar of foreign investors from the beginning of China’s economic reforms. 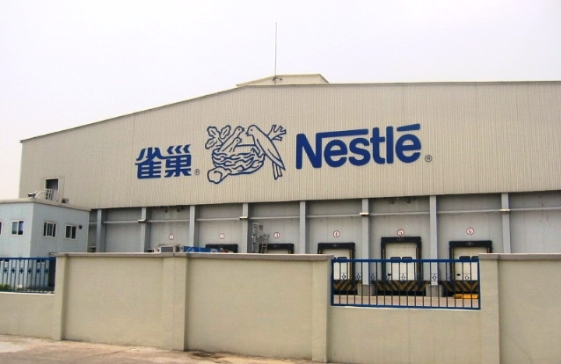 Nestlé was one of the first Western multinationals to invest in China, with a joint venture for the production of infant formulae in Acheng, a suburb of Harbin in the 1980’s. This subsidiary of Nestlé has withstood all turbulent developments of China since then. Another multinational, McCain, started a potato processing venture in Harbin in 2005. The venture included a 7.5 ton/hour plant and two associated potato storage facilities. McCain Foods has been preparing for its expansion in China for a long time before it finally chose Harbin. 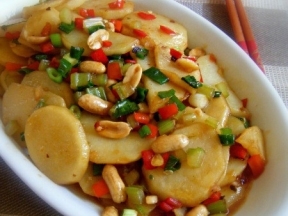 The company stated that Heilongjiang Province produces the largest output of potatoes yearly. With its unique geological position adjacent to Russia, Harbin may prove an ideal investment location for companies who want to tap the Far East market, he said. The company decided to double its capacity in 2012. Other foreign investors in Harbin include a yeast plant of Burns Philp. That makes sense, as bread has been part of the local cuisine for a long time. Even thought lieba is a kind of sourdough, yeast bread was easily adopted as a quicker alternative for the traditional Russian style bread. 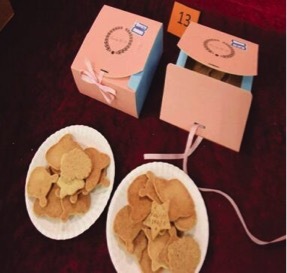 I myself have organized a number of baking seminars, when I was promoting yeast and bread improvers of Gist-brocades (now part of DSM) in China. China has reacted quickly to cash in on the opportunities created by the trade war between Russia and the EU/US. This will be an extra large boost to the importance of Harbin as China’s northernmost foreign trade hub for food and agricultural products. Harbin’s ‘Russian’ background will certainly facilitate this development. 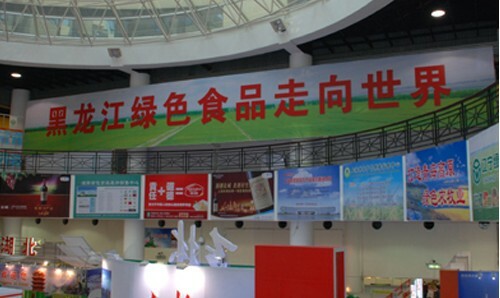 The China Harbin International Economic and Trade Fair was renamed into Sino-Russian Expo in 2014. 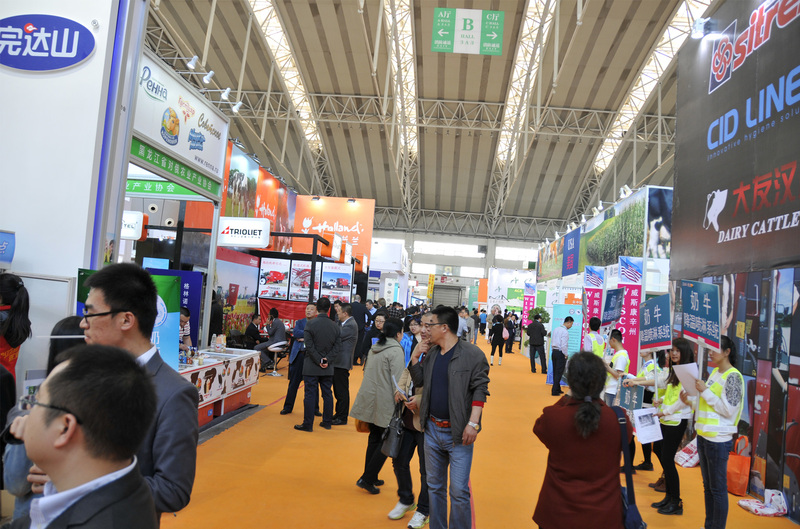 The World Dairy Expo & Summit will be organised again in Harbin, april 21 – 24, 2016. The 2015 edition attracted 15,728 visitors from all over the world. Heilongjiang is China’s primary region for organic agriculture and Harbin is again a centre for this industry. The municipal government has build a large modern food storage and distribution system for organic produce. The system includes a food logistics centre with an annual handling capacity of more than 1 mln mt, three distribution centres with a combined annual handling capacity of 1.5 mln mt and 11 grain depots each with a storage capacity of 200 000 mt. McDonald’s sources the rice it uses on the mainland from Harbin. The city grows some of China’s top-quality rice. It has more than 600,000 hectares of paddy field producing 3.25 mln mt of rice a year as well as some 200,000 hectares of soybeans, none of it genetically engineered. It is not necessarily organic rice, but at least is produced according to China’s ‘green’ specifications. Harbin also has annual corn output of more than 10 mln mt. The hybrid breed contains three times more protein than common breeds. In addition to farming, the city government also invests in livestock breeding and processing. It has nearly 500,000 cows, 3 mln beef cattle and 11 mln pigs, and produces 880,000 mt of meat, 365,000 mt of eggs and 1.5 mln mt of milk a year. The first flagship store for green food from Heilongjiang opened in Hong Kong in February 2014 offering more than 200 products. Of the 64 suppliers, 27 were based in Harbin. Harbin is an interesting alternative to for international investors in the Chinese food and beverage industry. On top of the advantages introduced above, the people of China’s Northeast are known as easygoing and honest. The good people of Harbin are outstanding hosts, entertaining their guests with supersize dishes of fish and meat, to be washed down with lots of baijiu, traditional Chinese spirits. It may take a little longer to negotiate a deal. They take their time to get to know you and do not feel the urge to put on a business-like act when dealing with foreigners, as you often see in other parts of China. However, once the believe they have figured you out and the impression is positive, you are in. The county of Mulan, in Harbin’s northeast, is an important site on the Silk Road Economic Belt. Its connection with Harbin has been strengthened by the completion of the Mulan-Songhuajiang Bridge. Mulan has a population of 280,000 and covers an area of 3600 square meters. It administers six towns and eighty-six villages. There are thirty reservoirs along the Songhua River in the county and the forest coverage rate is nearly 50%. 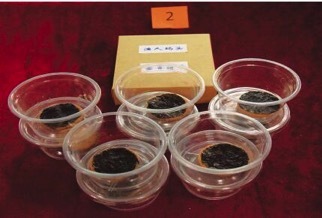 Mulan has been awarded various titles, such as “National Ecological Agricultural County”, “National Green Rice Production Base” and “National Rural Tourism Demonstration County”. Mulan is also known for its, rice, coffee and beer. Located in the black soil area of northeast China, it enjoys distinct seasons, adequate sunlight and moderate rainfall, which contributes to the excellent quality of its crops. Hundreds of kinds of precious herbs grow in the 670,000 hectare forest and the abundant grassland feeds flocks and herds. With the improvement of agricultural infrastructure, Mulan has seen remarkable progress, especially in rice and red meat processing. 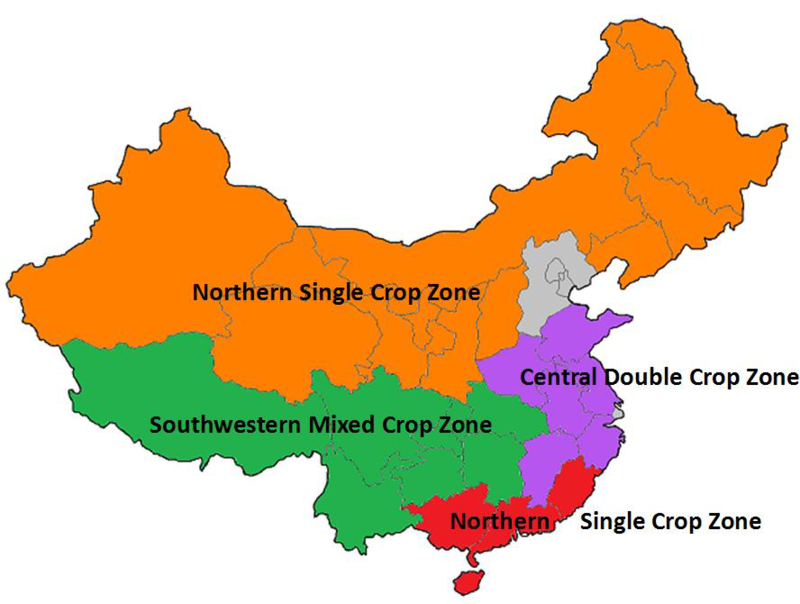 With the support of related policies and modern agriculture reform in Heilongjiang, the county has seized all opportunities to construct a grain production base, developing grain processing efficiency and funding a green food industry. It built an 8-square-meter agricultural production park to bring together various agriculture projects for cooperation. In August, 2014, the Chinese Academy of Agricultural Sciences (CAAS) Grain Processing Technology Institute (Harbin) settled in the industrial park, the first national organization instituted by CAAS in Heilongjiang. It focuses on grain processing, product innovation and inspection services. This move inaugurates a new cooperation method between national research groups and local food industries. In future, Mulan plans to expand the market to Russia, North Korea and Japan with the help of the Heilongjiang Silk Road Belt and, in three to five years, become the leading food research center of Northeast Asia. That development would improve Heilongjiang’s influence in the area. The government intends to pay more attention to ecological protection and sustainable development under emerging circumstances to create a better Mulan.